Mesocolloid is a trademarked name of Purest Colloids, Inc. that refers to an entire group of metal colloids that are produced using the the mesoprocess. The term mesocolloid was coined the scientists at the CSL who developed the method of producing colloids consisting of mesoparticles . Purest Colloids, Inc. is the exclusive worldwide producer of the Mesocolloids. Meso-World shows the relative size of the silver particles in Mesosilver. For a constant concentration of metal particles, the particle surface area increases as the particle size decreases. In the chemical world, reactivity increases with increasing surface area. Therefore, the effectiveness of colloidal solutions increases with decreasing particle size as the particle surface area increases. For this reason, particle surface area serves as a metric for comparing colloidal solutions. In metal colloids the increase in reactivity that derives from the increased particle surface area translates directly to effectiveness of the colloid. Surface area is expressed in square centimeters (cm2) per milliliter (mL) of colloidal solution, and is written as (cm2/mL). Compared to colloidal products produced by other methods, Mesocolloids have the highestparticle surface area because of the combination of small particle size and high concentration of particles. See the Comparison Table for comparitive examples. Mesocolloids are characterized by the small size of the mesoparticles that constitute the colloid and the high percentage of particles vs ions. The mean size of the particles is typically less than 1 nm in diameter (0.65 nm typ) as measured by Photon Correlation Spectroscopy (PCS). For more details on the relationship of particle surface area as a function of concentration and particle size, see the Colloid Surface Area table. For a discussion of the rationale for using particle surface area as a metric for comparing colloids see Comparing Colloidal Silver Products . The term mesoparticle refers to very small particles whose size is larger than an atom and smaller than conventional small particles. The term nanometer refers to 1 billionth of a meter. The mesocolloids use the prefix meso before the name of the metal that constitutes the colloid, i.e. 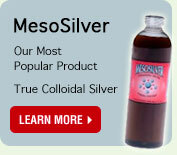 Mesosilver and Mesogold..
For detailed scientific information concerning the science of colloidal silver, go to www.Silver-Colloids.com . Here you will find a wealth of information and a free book about colloidal silver.